To help spring forward into warmer weather, I created a couple of cheerful, summery cards using Sandcastle Avery and Sandcastle Owen. Both cards were made using paper from the Echo Park ‘Hello Summer’ collection. I love the paper in this stack! So cute and full of fun summer colors. 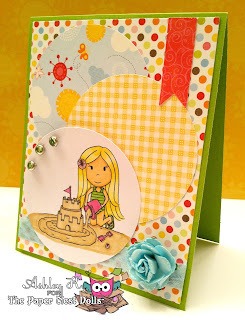 I also used crinkle ribbon from 3 Girl Jam on both cards. Thanks for stopping by today! Don’t forget we have a super fun Copic contest going on and you can still receive 20% off your entire order of digital stamps using the code “I love paper” when checking out at The Paper Nest Dolls store.